(Oct. 22, 2018) In the first major step of evaluating Portland’s e-scooter pilot program, PBOT surveyed nearly 75,000 customers of Bird, Lime and Skip, the three companies permitted to operate e-scooters in Portland. The wide-ranging survey asked customers about their riding habits, their perceptions of scooter safety and popularity and whether they replaced car trips with scooter rides. More than 4,500 people responded, and the results suggest scooters are a popular new transit option for Portlanders and visitors alike. 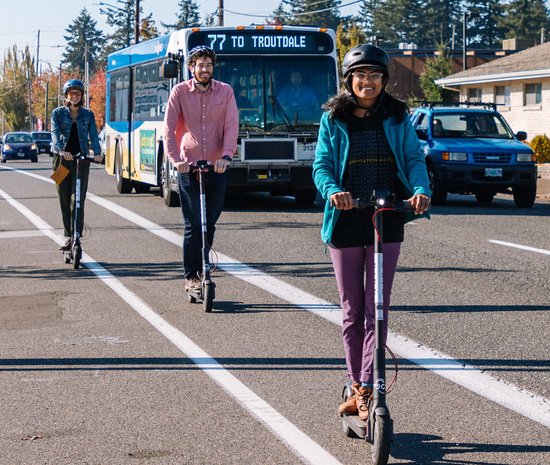 Portlanders are using e-scooters for transportation and recreation. Nearly a third (30 percent) of the Portlanders who responded to the survey said they most frequently used e-scooters to commute – to get to work, school, or a work-related meeting. Another third (28 percent) stated they most frequently used e-scooters for fun/recreation. E-scooters are popular with local users. Eighty-five percent of Portlanders said they were “extremely” or “very likely” to recommend e-scooters to a friend. Among all respondents, e-scooters appear to be more popular among men (62 percent) than women (36 percent). In response to the question, “What gender do you identify with?”, 62 percent of respondents said “man”, and 36 respondents said “woman”. All respondents – Portlanders and visitors – prefer to ride e-scooters on the street, in the bike lane. Riders’ stated preference was for the bike lane over even off-street trails. Riding on sidewalks was users’ least preferred option. The majority of users know the e-scooter laws, except for riding on waterfront trails. Users scored between 77 and 95 percent correctly on all e-scooter law questions except for rules that prohibit riding in City Parks and on the waterfront trails. Only 51 percent thought riding was illegal in parks and 34 percent thought riding on waterfront trails was illegal. PBOT’s evaluation of the e-scooter pilot is ongoing. Other components of the evaluation will include focus groups, rider behavior observations, trip data analysis, safety data analysis (including reported crashes), and analysis of feedback and complaints submitted through the project’s online form. The City is also collecting trip data from the companies. As of October 11, 2018, 472,069 trips have been taken on e-scooters in Portland, with an average trip length of 1.2 miles. The evaluation period will conclude with a Findings Report released shortly after the pilot ends on November 20. Beginning November 21, shared e-scooters will not be available in Portland as PBOT evaluates whether they will be a long-term part of Portland’s transportation system. Shared Electric Scooters, also known as e-scooters, are an emerging technology and shared mobility service. The first systems in the U.S. launched in 2017. Similar to bikeshare, the service provides personal transportation to rent for one-way trips. To begin a rental, companies typically require customers to download an app or text a number to unlock the device. To end a trip, customers park the scooter on the sidewalk close to the curb. The scooters are not locked to docks or stations or other objects such as bike racks or street signs. Electric scooters are powered by an electric motor, and in Portland, companies are required to cap the maximum speed at 15 MPH.